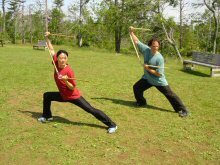 At the Halifax Wushu Club in Halifax, Nova Scotia, Canada, we train mainly in the traditional Chinese martial art of Beijing Chuojiao Fanzi 戳翻子 . We do practice other styles of Chinese martial arts but our main focus is Chuojiao Fanzi. Wushu is the Chinese word for martial art and around the world wushu is also known as "kung fu". 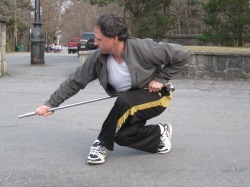 Wushu is also a term used for modern/contemporary competitive Chinese martial arts. 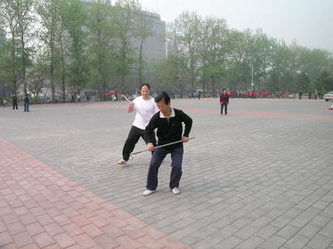 Additionally, there are hundreds of Chinese ancient traditional wushu/kung fu fighting styles. Our classes generally are run outside all year long in the evenings in and around Point Pleasant Park. Chuojiao Fanzi is a comprehensive martial arts system with a rich and fascinating history. It was created by merging 2 existing systems: Chuojiao, which is famous for it's wide variety of kicking techniques and Fanzi, known for it's lightning fast hand strikes and unpredictable defensive changes. The two styles were combined to balance the system. On its own, each style gives great physical and martial benefit, but together the strengths of both styles, fast hands and terrifying legs, combine into an extraordinarily fluid, lethal system. 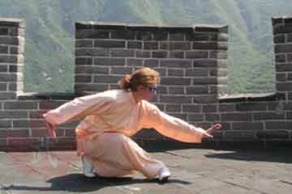 Chuojiao Fanzi Quan is a challenging wushu style, requiring above-average commitment, flexibility and aerobic fitness. The branch of Chuojiao Fanzi practiced at our club is known as Beijing Chuojiao Fanzi 戳翻子 and comes directly from the legendary Wei Chengyi, who passed on the style to his nephew, Wei Zankui, both of whom served as Imperial bodyguards to Chinese Emperor Guangxu. Wei Chengyi and Wei Zankui were excellent fighters and proved the effectiveness of their Chuojiao Fanzi skills many times in combat. 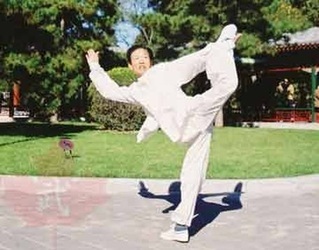 Famous Xing Yi Master Li Fuzhen remarked after accepting a friendly challenge from Wei Chengyi, that he had the strongest kicks he had ever felt. 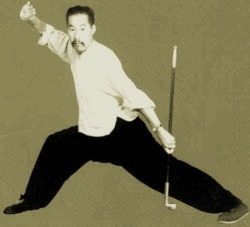 Li Fuzhen was so impressed, in fact, that he asked Wei Chengyi to teach him some Chuojiao kicks, which he later incorporated into his branch of Xing Yi. 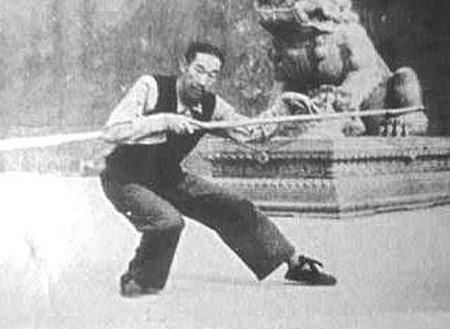 Wei Zankui had the nickname of "Iron Legs", due his extraordinary leg conditioning. He was known to let a car with iron rims drive over his legs without injury.When the Empress Dowanger Cixi had Emperor Guangxu imprisoned, she sent his bodyguards home, relieving them of their Royal duties. Wei Zankui returned to LiXian, in Hebei province, and began to teach Chuojiao Fanzi. 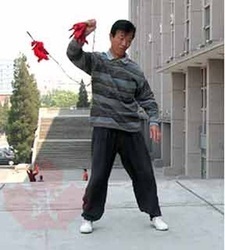 Shortly before his death, he took part in a public demonstration by performing Ditang Chuojiao, which incorporates many acrobatic flipping and tumbling skills, despite being in his mid 90's. Wei Zankui passed away in 1950. Wei Zankui's top student was Wu Bin Lou, who moved to Beijing in 1921. Like his teachers before him, he was an extraordinarily dedicated student and an excellent fighter and as such won many duels. With his high level of skill and good moral virtue, Wu Bin Lou made many good friends with different masters in Beijing who were the heads in their respective styles, including Chen Fake and Zhao Zhong. 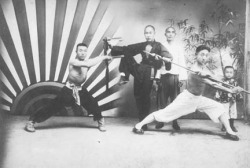 He was particularly skilled with the Jiu Jie Bian (steel whip) and so earned the nickname, "Flowery Whip Wu Bin Lou". Though he was in high demand for instruction, Wu Bin Lou only taught a select few students the true skills of Chuojiao Fanzi. 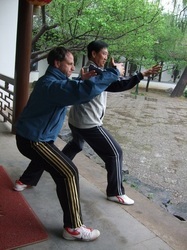 Wu Bin Lou's students Di Guo Yong and Wang He Ling are the teachers of Andrew Gordon. Andrew had the opportunity to train with both Wang laoshi ("laoshi" = teacher/coach) and Di laoshi several times in Beijing. Andrew brought his knowledge back to Canada and shared it with the members of Canada East Wushu. Josh Arnold, who has been studying kung fu / wushu since January 1987, has trained for many years with Andrew and was fortunate enough to train very briefly with Wang laoshi and Di laoshi in 2008. Wang laoshi and Di laoshi are highly skilled martial artists and also wonderful people who exhibit true "Wu de," or martial virtue. We have tried to adopt their patient teaching style in Halifax. Lu Yan was a member of the first Beijing Wushu Team. She is a five time Chinese National Wushu Champion. Lu Yan was declared a Martial Hero by the Chinese Government. 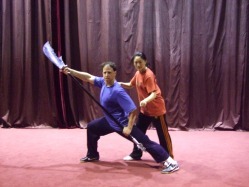 She has been a professional wushu coach since retiring from competition in the 1980's. Yan has come to Halifax to teach our club on many occasions and students from our club have gone to Beijing to train with her as well. As a child, Yan was invited by world renowned Wushu coach Li Junfeng to start training at the Shichahai Spare Time Sport school. This school was very soon to become far from ‘spare time’ for Lu Yan, when she was invited to join the world’s most renowned Wushu team, the Beijing Wushu team. Over the next 13 years Yan trained alongside Wushu legends such as Li Lianjie (Jet Li), Wang Jianjun, Hao Zhihua and Li Xia. The exceptional standard of these athletes brought a level of fame to the Beijing Wushu Team that still echoes today. Retiring from competition to concentrate on coaching, she first studied for a degree in physical education at Beijing Capital Sports University. After graduation she spent two years in the Philippines preparing them for both Asian and World Wushu competitions. Due to her efforts they had their best results ever, taking over 15 Gold Medals in four International competitions. Returning to China, Lu Yan was accepted to teach alongside one of her former coaches, Wu Bin. She still lives and teaches in Beijing. 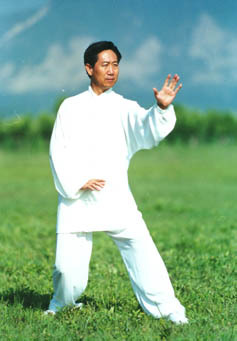 Wang He Ling (see below) was a student of Wu BinLou. Wang HeLing is a Chuojiao Fanzi master and is the current president of the Beijing Chuojiao Fanzi Federation. Andrew Gordon is a Chuojiao Fanzi student of Wang HeLing , Di GuoYong and is also a student of Men Huifeng, Lu Yan, Cao Yong and Andrea Falk. Andrew brought Beijing Chuojiao Fanzi to Halifax. 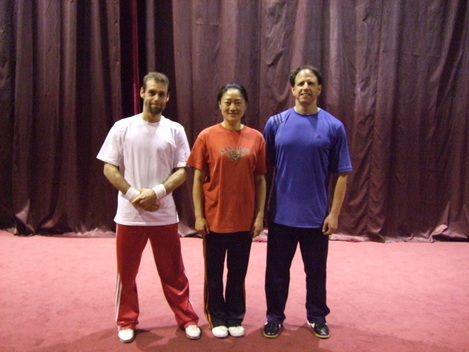 Andrew with Di Guoyong and Wu Bin, Jet Li's teacher and Head Coach of the first Beijing Wushu Team. Josh Arnold was a long time Chuojiao Fanzi student of Andrew Gordon and also, albeit briefly, of Wang HeLing, Lu Yan, Andrea Falk and trained for about two seconds with Di GuoYong. 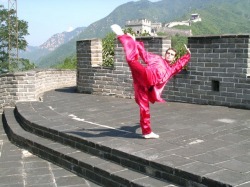 Josh is now running the Halifax Wushu Club and teaching the Beijing Chuojiao Fanzi classes. Please contact Josh at joshhfx@gmail.com for info regarding times and location. 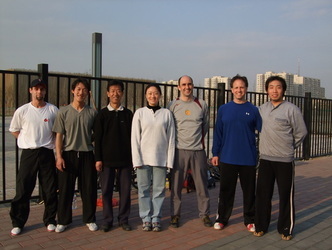 ﻿The Halifax Wushu Club (in its' various forms) has been responsible for bringing to Halifax such world class instructors as Lu Yan (www.luyanwushu.com) (Contemporary Wushu) and Andrea Falk (www.thewushucentre.com) (Xing Yi, Bagua and, again in 2010 even Contemporary Wushu). 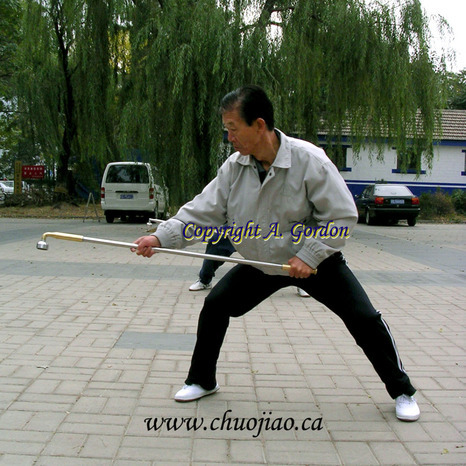 Canada East Wushu (the previous incarnation of this club) was started by Andrew Gordon circa. 2004. 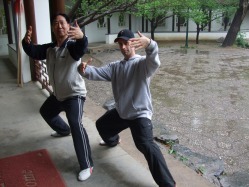 Both Andrew and Josh Arnold were long time students at the Nova Scotia School of Kung Fu and Tai Chi, Josh having started training Nanchuan (southern style) kung fu in January 1987. Andrew started training his training there five years later, in 1992. Other martial arts experience for these guys: Josh earned a black belt in Kenpo Karate in 2000 in the middle of his kung fu training. Andrew had previously studied Shotokai Karate under Amin Nasr. 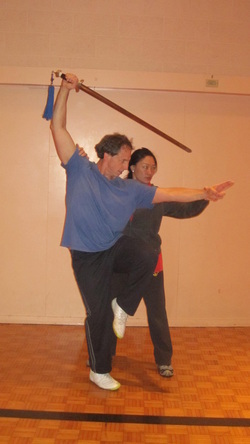 Andrew eventually left the Nova Scotia School of Kung Fu and Tai Chi and came to know Canadian wushu pioneer and legend Andrea Falk and invited her to Halifax on a variety of occasions, originally to teach Xing Yi and Wushu (Andrea now comes to Halifax to teach MaGui Bagua and Xing Yi...with a little Contemporary Wushu thrown in on occasion). 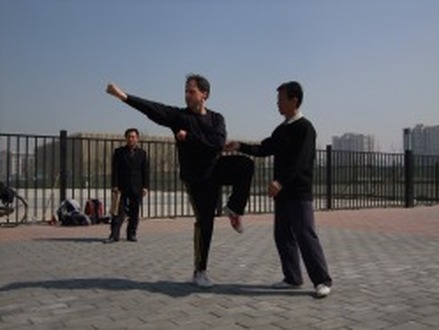 With Andrea's assistance, in 2004, Andrew went to Beijing for the sole reason of studying Wushu and had the good fortune of becoming the student of such incredible martial artists as Men HuiFeng, Wang HeLing, Di GuoYong and Cao Yong. 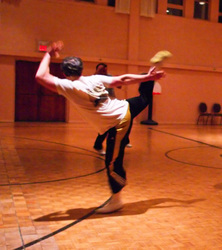 Andrew returned to Halifax and started his club, Canada East Wushu. Andrew has since traveled to Beijing for further training on several occasions since his first trip, training with Di GuoYong, Wang HeLing and Lu Yan. Andrew has also taken interested martial arts practitioners from Halifax with him. In 2006 Andrew took Alex P. and Aaron E. In 2008 Josh and Andrew made the trip for more training. In January 2011, Kim E. moved to Beijing and trained extensively with Lu Yan until December 2011. Kim also trained briefly with Wang HeLing. In May 2011 and May 2013 Andrew again went to Beijing for a month of hard training.